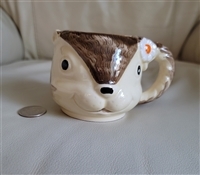 ENESCO Japan ceramic Squirrel mug with handle, 1979. Luterware creamer made in Japan. Vintage Japanese oval plate with two handles. Occupied Japan figurines man and woman beautiful decorative item. Japanese white porcelain kissing ducks salt and pepper shakers. Porcelain Washington US Capitol shaker from Silberne, Japan. Set of two Japanese vintage porcelain geese or ducks decorative display. Vintage small porcelain set with water pitcher and basin, pitcher, sugar bowl in fruit had painted decor from Fairway and Allied Japan. Set of various lone vintage shakers glass, porcelain vintage collectibles. German Shepherd OCCUPIED JAPAN porcelain figurine. 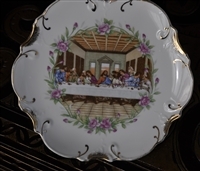 Maryland China snow white porcelain embossed design candle holder attached under plate and snuffer. Kitty Cats on the baskets salt and pepper shakers, Japan. Vintage ceramic Rooster creamer and Hen sugar bowl, Japan. Japanese cobalt blue salt and pepper shakers. Made in Japan teacup with saucer, Lustre finish. Inarco Japan tall set of salt and pepper shaker, floral with hearts top. Vintage porclain Chefs salt and pepper shakers Japan. Japanese Rasberry bushes vintage large shakers. Ben Rickert porcelain swan made in Japan from 1980s for candle or scents storage. Vintage Marutomoware Japanese porcelain Schnauzer or Terrier large dog figurine. Vintage Wales porcelain sitting Beagle dog figurine in white and brown colors decorative figurine. Vintage porcelain German Shepherd figurine from Japan.